Cleveland homes built before 1970 are 80% likely to have been built without any insulation on the exterior walls, or side-walls. Once your attic insulation job has been completed, or has been determined not to be your leading cause of heat loss, the homes sidewalls, or exterior walls are the next greatest source of energy inefficiency. Many homeowners can even experience noticeable drafts from wall outlets or feel how cold their exterior walls are in the winter from inside their home. 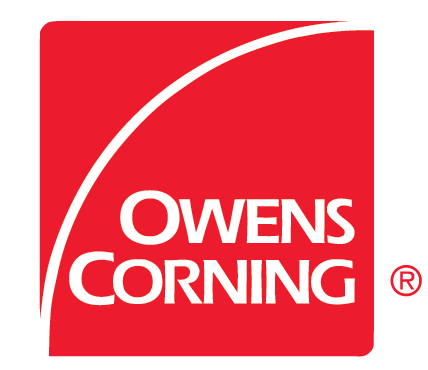 At Myers Insulating Services we specialize in sidewall insulation with our blown-in, or loose fill, fiberglass insulation application. WHEN INSULATING YOUR EXTERIOR WALLS FROM THE ATTIC ISN'T POSSIBLE, HOLES ARE CUT IN THE WALLS ABOUT EVERY 16" TO BLOW THE INSULATION IN. IF THE WALLS HAVE FIRE STOPS A SECOND ROW OF HOLES ARE PLACED BELOW THE HORIZONTAL 2X4S. Although it may seem complicated, the process of retrofitting an existing home's exterior walls with the best insulation is simple, cost effective and will not leave any damage. 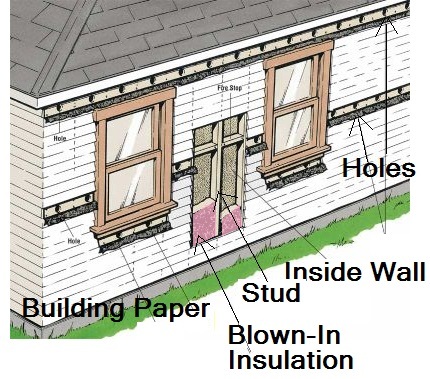 Depending on the home's finish will determine how the insulation installation crew removes some of the outside finish, for example vinyl siding, clapboards, tongue and groove, brick, brick veneer and wood siding shingle in order to create openings in the sheathing so that fiberglass can be blown into the empty stud spaces. Openings are made in order to blow loose fill insulation in between the studs throughout the home's exterior walls at a density that will provide the ultimate in energy efficiency. After the insulation has been installed, all holes are covered with building paper and the home's exterior finish, whether vinyl siding, clapboard, or other finish, is replaced in the most expert manner, making sure to fill any nail holes or splits with putty and touch up paint when necessary. After the job is completed by Myers Insulating Services professional insulation installers you will not notice small openings were ever made in your home's exterior walls in order to retrofit premium insulation - and you will never again notice cold exterior walls draining your energy bill!